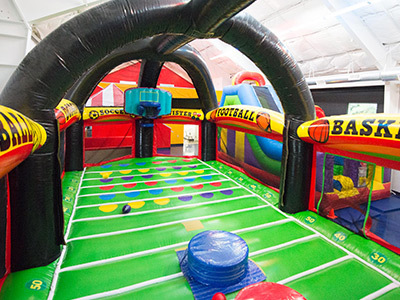 Interactive Inflatables, Games Galore & Green Screen, and Complete Party Facilities! 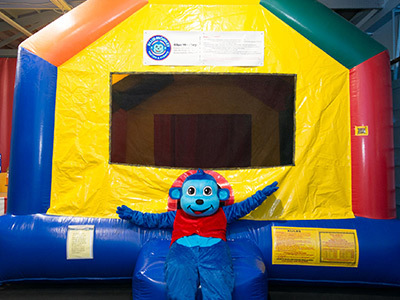 The Blue Monkey Sports Arena offers unlimited game choices on an inflatable platform. Enjoy traditional sports games, dodgeball, soccer, joust, Nerf Wars, Twister, volleyball, football, basketball, basketball, and more. 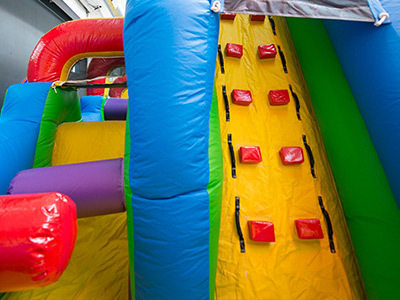 This gigantic inflatable slide is the perfect way to combine fun and healthy activity. Slide delivers the fun with twin slide lanes and 1 climbing lane. 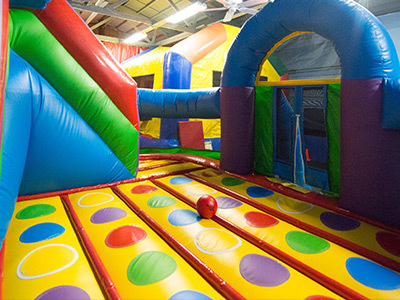 This wacky-colored mini obstacle is a challenge designed with smaller patrons in mind. It features tunnels, tackle dummies, squeeze plays, a climbing wall and slide. 180 degree design allows patrons to enter and exit on. This bounce house is the perfect way to combine fun and healthy activity. This jumper has mesh windows so parents can have a clear view of all the fun. This eye-catching Wacky KidZone™. 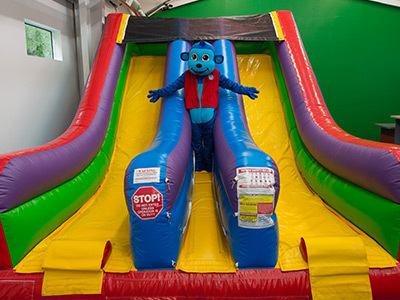 KidZones have spacious bouncing areas with an Entaglement™ game mat sewn on, and climbing and sliding lanes. For added safety, this unit features an XTRA-Grip climb cover that reduces slips and helps to keep kids safe. Go back in time and enjoy playing low tech games with high entertainment. 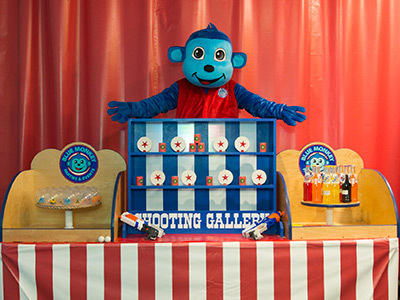 Play carnival classics with prizes such as the Shooting Gallery, Ring Toss, Fish Bowl and Knock'em Down. Through green screen technology, you and your friends can be on the cover of a magazine or at popular land-marks, or with your favorite hero. 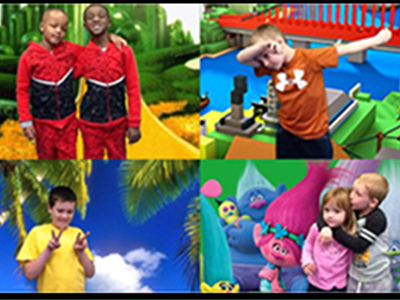 The Green Screen is the perfect addition for your event. 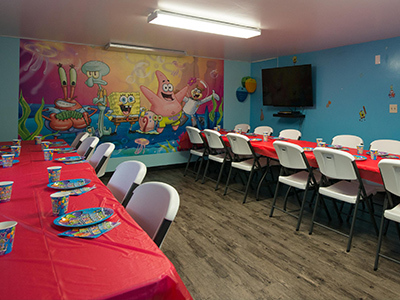 Our Sponge Bottoms Party room features and underwater theme and is on our main level and can accommodate up to 25 guests. Our Blue Monkey Balcony Party room is on our second level and can accommodate up to 35 guests. 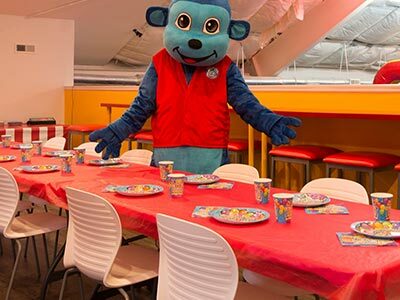 Register your next event online for your children's birthday parties, group and special events, facility rentals, parent's night out, fundraisers, and off site events. 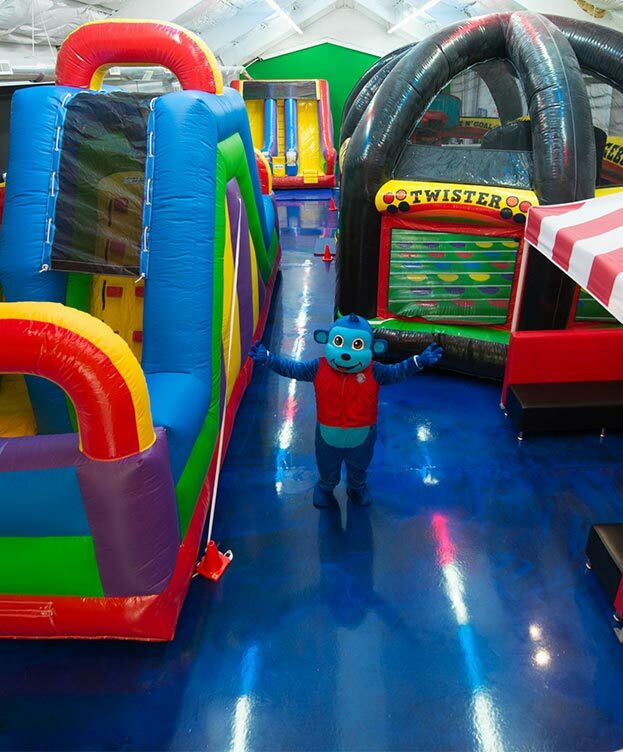 The #1 Ranked Childrens Party Center in Central Ohio on Facebook and Google!